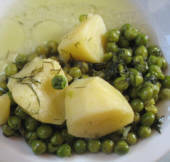 Peas with dill are a fabulous taste combination, and this recipe adds potatoes and a touch of lemon for a light main dish or vegetable side. 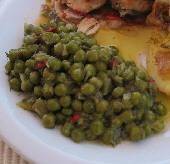 Fresh peas can be substituted for the frozen, but not canned. Note: Take peas out of the freezer when peeling the potatoes. They will not defrost before adding to the pot. Sauté dill and onion in oil in a large pot until onion softens slightly. 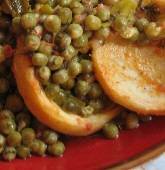 Increase heat to high and stir in peas, potatoes, salt, and water. Bring to full boil, reduce heat, cover, and simmer for 25-30 minutes, until potatoes are fairly soft. In a small bowl, combine lemon juice and flour and stir until the flour dissolves. Add 1/2 cup of liquid from the pot, stir to mix well, and pour the lemon mixture into the pot. Stir, cover, and cook 5 minutes more. Turn off heat and leave the pot on the stove for 15 minutes before serving. Yield: serves 4-5 as a main dish, 6-8 as a side.